Age: Not more than 40 years as on 31.03.2017.
recognized University/ Institution shall be preferred. any other large service sector. Age limit: Not more than 40 years as on 31.03.2017. Educational Qualification: Post Graduate/ MBA from a recognized University/ Institution. banking products across mass media. cultural nuances of different states of India especially with respect to retail banking products. develop effective and outstanding creative solutions/ campaigns. Public Sector Bank, preferably with awareness of SBI work culture and management practices. search & display, SEO, SEM and programmatic. optimize the campaign performance. Broad familiarity with contemporary DM technologies. 4. Highly data oriented with good acumen for number crunching. 1. Minimum 10 years experience in varied marketing roles including media strategy and operations. 4. Well versed with media plan analysis with the ability to make course corrections. 5. Highly data oriented with solid acumen for statistics. Age Limit: Not more than 35 years as on 31.03.2017. Experience: Minimum 2 - 4 years of experience with career experience of similar role in B2C Business/ Industry. at the discretion of the Bank. The contract can be terminated at one month’s notice on either side or on payment/ surrender of one month’s compensation amount in lieu thereof. Applicants have to pay Rs 600/ – as Application fee paid through online mode by Internet Banking/ Debit/ Credit card. After payment an e-receipt will be generated candidates have to take printout of this e-receipt. Eligible Applicants can apply online through the website https://bank.sbi/careers from 12-05-2017 to 25-05-2017. Applicants must fill all the details online application form and upload scanned photograph, signature as per guidelines, pay the fee and click submit button. Candidates have to take printout of application form. 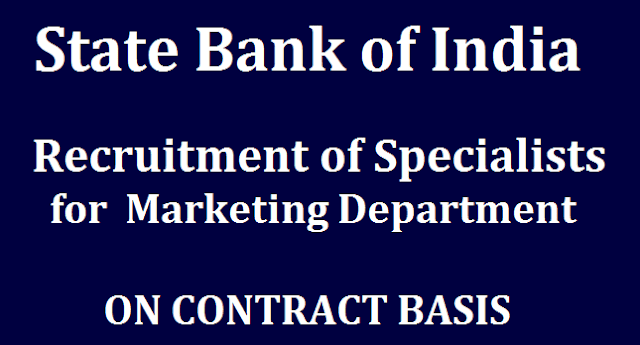 The hard copy of application form along with photocopies of relevant documents should be sent on or before 31-05-2017 to State Bank of India, Central Recruitment & Promotion Department, Corporate Centre, 3rd Floor, Atlanta Building, Nariman Point, Mumbai – 400 021.